As a reliable name, we ensure that payment procedures remain secured with us. For this, we issue an invoice to the customers stating the products, quantities and agreed prices. Based in Sialkot(Pakistan), we are entrusted with the chore of providing top-notch products in the domestic market. 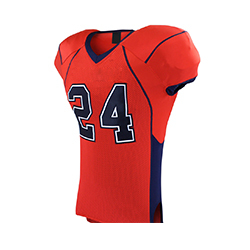 WB-1606 American Football Uniform has high stretchability with a regular fit design and several color options.